GAOTek Inc. announces its Next Generation Digital RF Millivoltmeter and Frequency Counter can measure the sinusoidal signal voltage from 9 kHz ~ 3000 MHz with excellent rapid frequency response, small standing wave co-efficient and low power consumption. 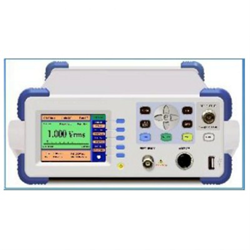 GAOTek Inc., a leading provider of fiber optic and telecommunication testers, electronic measurement instruments and other advanced engineering products, its next generation Digital RF Millivoltmeter and Frequency Counter can measure the sinusoidal signal voltage from 9 kHz ~ 3000 MHz with excellent rapid frequency response, small standing wave co-efficient and low power consumption. This new instrument comes with a new micro-processor chip which has high resolution, high precision and is cost-effective. With RS-232 and optional GPIB and USB interface; this instrument uses a QVGA color LCD display and conductive key function control for clear reading and can also be used as a remote measurement control. “We at GAOTek have always believed in delivering value, benefits and quality to our customers at substantially better prices than our competitors. GAOTek’s Digital RF Millivoltmeter and Frequency Counter is no different as it is powered by our state of the art technology, offers world-class features and is extremely easy to use in the field,” says Dr. Frank GAO, CEO, GAOTek Inc. The product is available on https://gaotek.com/, as well as some leading e-commerce marketplaces. GAOTek Inc. now offers one of the world's largest selections of advanced fiber optics instruments, fiber optic transceivers, telecommunication testers, electronic measurement instruments, video surveillance, general test and measurement equipment, civil engineering, mechanical engineering, chemical engineering and other engineering products to satisfy the needs of global technical professionals. Serving customers from more than 50 countries, GAOTek is known for the high quality and best value of its products backed by a strong technical team that provides industry-leading support. GAOTek Inc. is a member of GAO Group of Companies, headquartered in Toronto, Canada with a strong global presence. The GAO Group consists of GAO RFID Inc. (http://www.GAORFID.com), GAOTek Inc., and GAO Research Inc. (http://www.GAOResearch.com), all being leaders in their respective markets.